Happy, Happy, Joy, Joy! 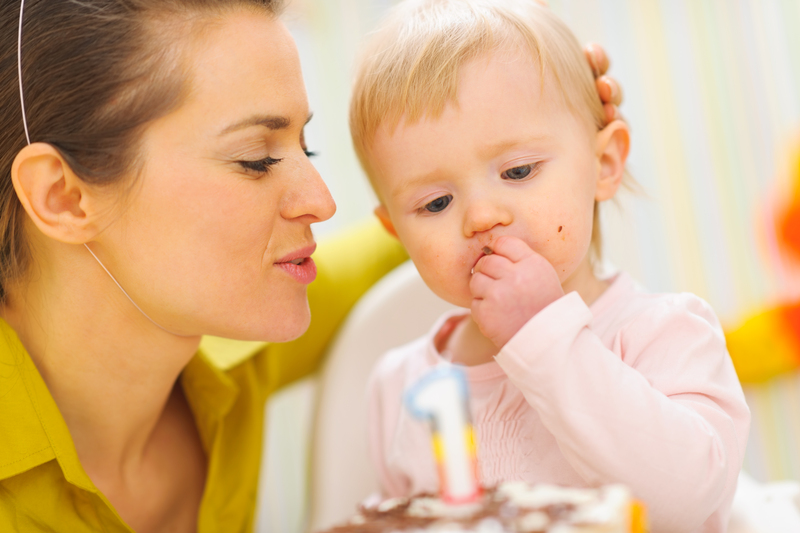 Your child’s first birthday is finally here! Whether you throw a huge bash with clowns, princesses and ponies or do a small gathering – or something in between – this is a memorable milestone that deserves to be celebrated! Movement and Motor Skills: By now, your little one is no longer a sleeping lump; he’s crawling, scooting, cruising (using tables and chairs for help) and may even be walking. His fine motor skills are also more developed and he should be able to hold small objects (like Cheerios) in a pincer grasp, using his thumb and forefinger. When determining “what should my child be doing at this age?” there is a myriad of answers because everyone develops differently. Some babies are slow to crawl or walk while others approach it like a challenge and move more quickly! And if he’s not? Ask the experts, like your pediatrician or a trusted resource like Moms on Call. Now that your baby is mobile, how do you parent this? First, if your house wasn’t completely child-proofed beforehand, you want to do that now. Just because he couldn’t access or touch something yesterday doesn’t mean he won’t do it today, so you want your house to be ready and safe. Also prepare to have less adult conversations while you hold or pass the baby and many more sentences that are never finished because you’re off following your child. As exhausting as this phase is, it is important for your baby to explore his surroundings and practice moving on his own. You can help this by carrying him less and letting him motor on his own (under your watchful eye, of course). Look on the bright side – it’s a great way to work off some nagging baby weight! Sleep: Your child continues to need about 14 hours of sleep a day, and is hopefully getting the majority of this at night. Ideally, you want your one-year old sleeping 11 hours at night and 2 naps during the day. However, in the upcoming months, it is common for the morning nap to go away and your child start taking a longer afternoon nap. Signs this is happening – when your baby takes a long time to fall asleep for the a.m. nap or else sleeps so long he doesn’t want the afternoon snooze.Giving up one of those naps can be a tough transition for both you and him, but it’s typical by the time he’s 18 months. Of course, these are children, not robots, so if your baby still needs two naps, by all means – let him have them! Food and Drink: This is the time to set the standard for your child’s food preferences so expose him to lots of nutritious choices early on. This includes your standard food groups – lots of fruits and vegetables, healthy grains in pastas, bread and cereal, good proteins (eggs, turkey, and chicken) and dairy such as cheese, yogurt and milk. Yes, your baby can finally have cow’s milk, and this will become an important part of his diet. Much like introducing baby food, your one-year old may not like everything you put in front of him. That’s ok – don’t worry and don’t be afraid to introduce it again at a later point. As frustrating as it can be to watch, let your baby try feeding himself. To prevent choking, however, always ensure that the food is soft, small and cut into baby-sized pieces. In the upcoming months, he’ll also be able to try feeding himself with a spoon or a fork, so expose him to that gradually. One of the hardest moments as a mom is watching that bottle — that source of nutrition, comfort and peace — go away. You may have already introduced your child to a cup but if not, now’s the time. Babies like what they like, so start gradually – after introducing the cup, start using it at lunch time. When he’s good with that – after a week or so – give him a cup with dinner and then move to doing the same at breakfast. The last step is losing the nighttime bottle which will happen once he is used to drinking from a cup and eating well at dinner; then he won’t need that bottle before bedtime. This part may take the longest as it’s breaking a comfy routine– or it may not happen easily at all. So take it slowly and be patient. No child ever took a bottle to college! Behavior and Attitude: It’s not that your child changes from your precious baby to a screaming toddler on the eve of his first birthday . . . but, as he develops, he’s gaining a sense of self and independence, and he’s starting to exert his will. Around this age, he’s mobile, he’s all over the place and he’s probably pushing boundaries. He’ll begin to hear the word “no” more often. He may not want to get in his car seat or have his diaper changed; he may want to climb on the kitchen table which is not allowed; he may want five cookies instead of just one – any of which might cause a mini-meltdown or a tantrum. These typically arise when your baby is frustrated, anxious or tired, so handle them as best you can. Remove the temptation or sometimes you may want to remove your child; other times, it’s just a matter of letting it pass or finally getting to the nap that your child needed. When possible, positively reinforce behavior you want to see (like letting Mommy change your diaper or being good when getting in the car seat). However, we don’t want to squelch that developing sense of independence, so when it comes to tantrums it’s like that dip in the roller coaster – ride it out! At this age, children may also develop separation anxiety, going with the babysitter or to preschool or other drop-offs. You can help this process by establishing and sticking to a goodbye routine – kisses and hugs, an “I love you,” whatever works for you and your child. If you stay positive, there’s a much better chance your child will as well, and all too often, as soon as you’re gone, any tears and sadness disappear for your baby. One thing to avoid, according to Dr. Jessica Young, a research scientist for the Education Development Center in Massachusetts, is to sneak away without letting your child say goodbye. If Mom and Dad sneak out the back door while the babysitter is entertaining the child, the lack of a goodbye may lead to more, not less, stress for your baby. So, grin and bear it! Talk, Talk, Talk: At this time in your child’s life, there is a lot of babbling and baby talk. 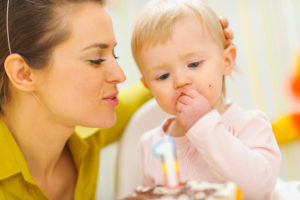 You’ll hear sounds and syllables, the same vowels (Ma-Ma, Da-Da) but your baby is probably not speaking coherently yet. That’s OK. What’s important at this phase of life is that he responds to other people talking to him – does he recognize your voices, does he respond to his own name being said, does he understand when you say “up” and raise his arms to be held? You want your baby to respond to noises and sounds he hears such as laughing when you laugh. Over the next several months, you will begin to hear your child say real words and respond to questions – “Where’s the Baby?” “Where’s your nose?” and even follow simple instructions. How do you cultivate your child’s language and communication skills? Engage with him! Talk to him even if he’s not talking back – have conversations (albeit one-sided) as you’re explaining or saying what is happening – “what is the bunny doing? The bunny is hopping.” “See the cow – cows say Mooooo.” So much of a child’s language comes from imitating you so talk, read, sing and your baby will learn from you. At this point in your baby’s life, so much has happened and there is still so much to come! It’s easy to get caught up in checking off the boxes and making sure your baby is doing everything the books (or your neighbor or your mother-in-law) says he should. But this is a stressful way to parent. Instead, be sure you’re on the same page as your pediatrician so that you know what to expect, and know that there are resources to ask for advice. And meet your child where he is – and from there, engage with him, play with him and have fun with him. Because before you know it, Birthday #2 will roll around and you’ll be parenting a two-year old!